A lovely way to count down to Christmas Day. 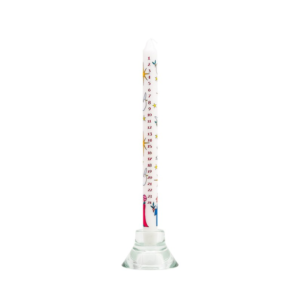 The perfect addition for any mantelpiece or dining table. This stunning advent candle is the perfect addition for any mantelpiece or dining table. This stunning Christmas dinner candle is the perfect addition for any mantelpiece or dining table. 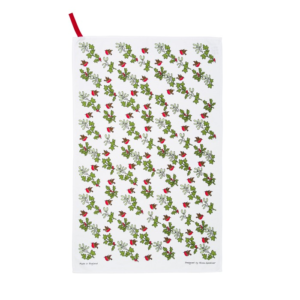 This beautiful tea towel is printed with Alison's hugely popular Holly and Ivy design and is beautifully decorative for the festive season. Our tea towels are screen printed and hand printed in one of the Old Mill Towns of Lancashire, where at one time half of the world's cotton was produced. Families have been passing on these skills for generations since the industrial revolution. 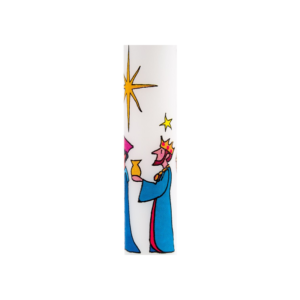 This particular design can also be found on one of our advent candles. 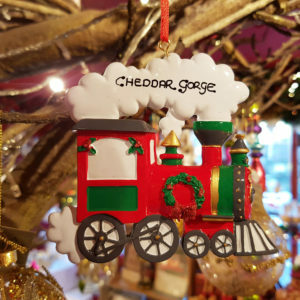 Hand written Cheddar Gorge hanging decoration. Christmas Tree Decoration. 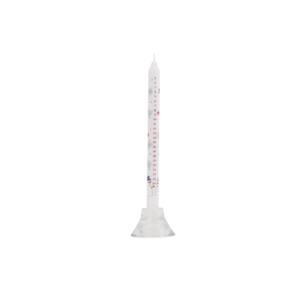 Material: Poly resin high quality gloss finish giving the appearance of glazed ceramic. Approximate Dimensions: 7 x 14cm. Comes complete with hanging ribbon. Image shown is for illustrative purposes only, as writing is applied by hand and will vary slightly from decoration to decoration. 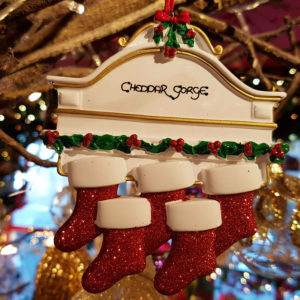 Hand written Cheddar Gorge hanging decoration. Christmas Tree Decoration. Material: Poly resin high quality gloss finish giving the appearance of glazed ceramic. Approximate Dimensions: 9.5 x 8 cm. Comes complete with hanging ribbon. Image shown is for illustrative purposes only, as writing is applied by hand and will vary slightly from decoration to decoration. 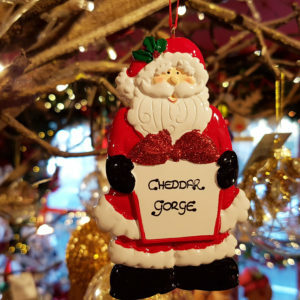 Hand written Cheddar Gorge hanging decoration. Christmas Tree Decoration. Material: Poly resin high quality gloss finish giving the appearance of glazed ceramic. Approximate Dimensions: Comes complete with hanging ribbon. Image shown is for illustrative purposes only, as writing is applied by hand and will vary slightly from decoration to decoration. 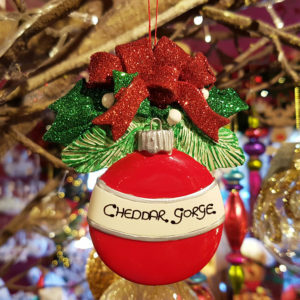 Hand written Cheddar Gorge hanging decoration. Christmas Tree Decoration. Material: Poly resin high quality gloss finish giving the appearance of glazed ceramic. 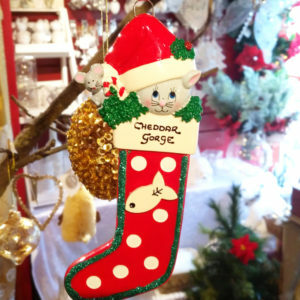 Approximate Dimensions: 11 x 9cm Comes complete with hanging ribbon. Image shown is for illustrative purposes only, as writing is applied by hand and will vary slightly from decoration to decoration. 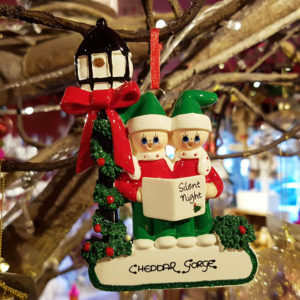 Hand written Cheddar Gorge hanging decoration. Christmas Tree Decoration. Material: Poly resin high quality gloss finish giving the appearance of glazed ceramic. Approximate Dimensions: 6 x 15cm. Comes complete with hanging ribbon. Image shown is for illustrative purposes only, as writing is applied by hand and will vary slightly from decoration to decoration. 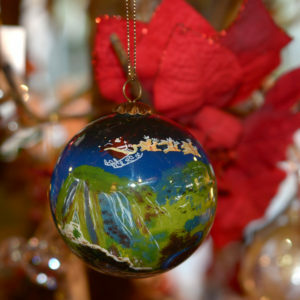 Painstakingly hand-painted on the inside, our unique 'Cheddar Gorge' Christmas glass bauble is presented in a dark blue padded Old Rowlands gift-box. Christmas Tree Decoration. Material: Poly resin high quality gloss finish giving the appearance of glazed ceramic. 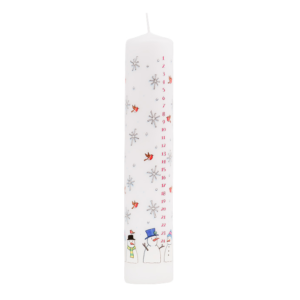 Approximate Dimensions: 9cm x 9cm Comes complete with hanging ribbon. Image shown is for illustrative purposes only, as writing is applied by hand and will vary slightly from decoration to decoration. 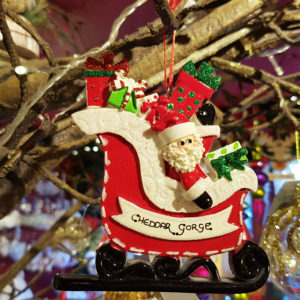 Hand written Cheddar Gorge hanging decoration. Christmas Tree Decoration. Material: Poly resin high quality gloss finish giving the appearance of glazed ceramic. Approximate Dimensions: 9 x 10cm Comes complete with hanging ribbon. Image shown is for illustrative purposes only, as writing is applied by hand and will vary slightly from decoration to decoration. Christmas Tree Decoration. Material: Poly resin high quality gloss finish giving the appearance of glazed ceramic. Approximate Dimensions: 10 x 9.5 cm. Comes complete with hanging ribbon. Image shown is for illustrative purposes only, as writing is applied by hand and will vary slightly from decoration to decoration. 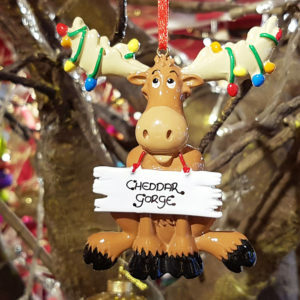 Hand written Cheddar Gorge hanging decoration. Christmas Tree Decoration. Material: Poly resin high quality gloss finish giving the appearance of glazed ceramic. Approximate Dimensions: 10 x 13cm (includes heart) Comes complete with hanging ribbon. Image shown is for illustrative purposes only, as writing is applied by hand and will vary slightly from decoration to decoration. 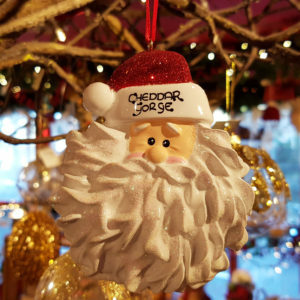 Hand written Cheddar Gorge hanging decoration. Christmas Tree Decoration. Material: Poly resin high quality gloss finish giving the appearance of glazed ceramic. Approximate Dimensions: 9cm x 9 cm. Comes complete with hanging ribbon. Image shown is for illustrative purposes only, as writing is applied by hand and will vary slightly from decoration to decoration. 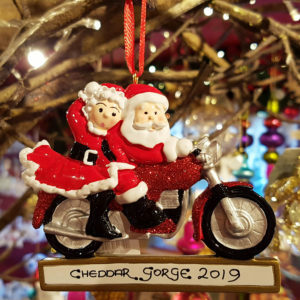 Hand written Cheddar Gorge hanging decoration. Christmas Tree Decoration. Material: Poly resin high quality gloss finish giving the appearance of glazed ceramic. Approximate Dimensions: 9 x 10.5cm. Comes complete with hanging ribbon. Image shown is for illustrative purposes only, as writing is applied by hand and will vary slightly from decoration to decoration. 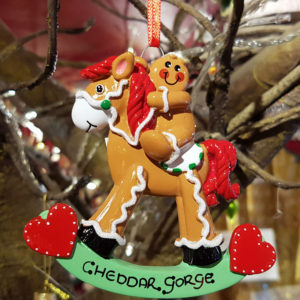 Hand written Cheddar Gorge hanging decoration. Christmas Tree Decoration. Material: Poly resin high quality gloss finish giving the appearance of glazed ceramic. Approximate Dimensions: 8.5 x 9.5cm Comes complete with hanging ribbon. Image shown is for illustrative purposes only, as writing is applied by hand and will vary slightly from decoration to decoration. 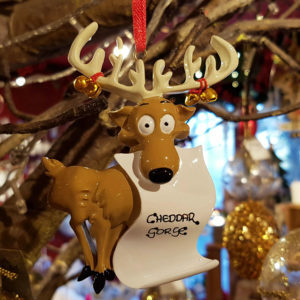 Hand written Cheddar Gorge hanging decoration. Christmas Tree Decoration. Material: Poly resin high quality gloss finish giving the appearance of glazed ceramic. 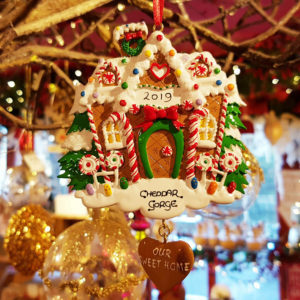 Approximate Dimensions: 9.5 x 8.5cm Comes complete with hanging ribbon. Image shown is for illustrative purposes only, as writing is applied by hand and will vary slightly from decoration to decoration. 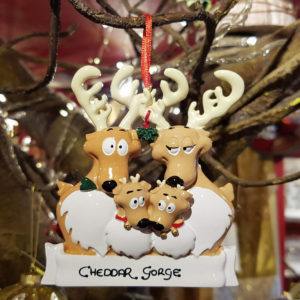 Hand written Cheddar Gorge hanging decoration. Christmas Tree Decoration. Material: Poly resin high quality gloss finish giving the appearance of glazed ceramic. 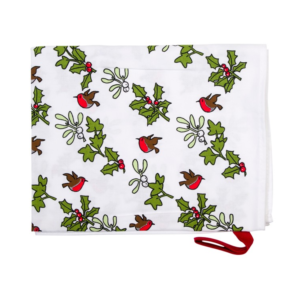 Approximate Dimensions: 10cm x 8cm Comes complete with hanging ribbon. Image shown is for illustrative purposes only, as writing is applied by hand and will vary slightly from decoration to decoration. 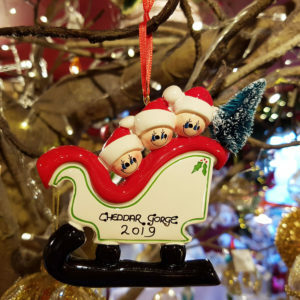 Hand written Cheddar Gorge hanging decoration. Christmas Tree Decoration. Material: Poly resin high quality gloss finish giving the appearance of glazed ceramic. Approximate Dimensions: 8.5 x 10 cm. Comes complete with hanging ribbon. Image shown is for illustrative purposes only, as writing is applied by hand and will vary slightly from decoration to decoration. 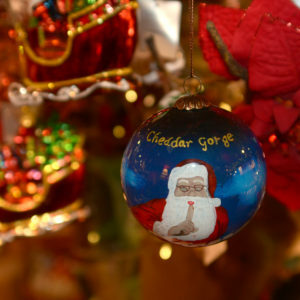 Hand written Cheddar Gorge hanging decoration. Christmas Tree Decoration. Material: Poly resin high quality gloss finish giving the appearance of glazed ceramic. 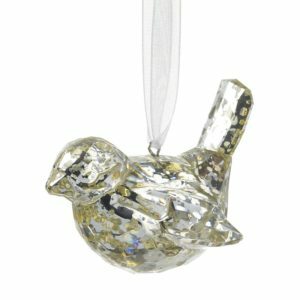 Approximate Dimensions: 10 x 6.5cm Comes complete with hanging ribbon. Image shown is for illustrative purposes only, as writing is applied by hand and will vary slightly from decoration to decoration. 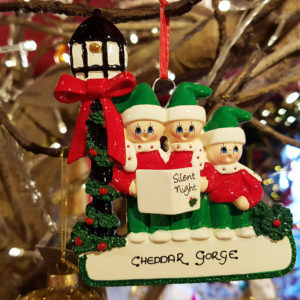 Hand written Cheddar Gorge hanging decoration. Christmas Tree Decoration. Material: Poly resin high quality gloss finish giving the appearance of glazed ceramic. 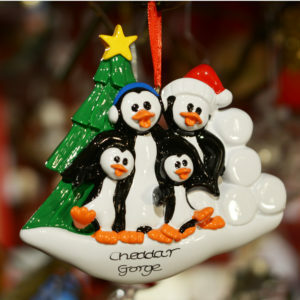 Approximate Dimensions: 9.5 x 9 cm (Excludes tree) Comes complete with hanging ribbon. Image shown is for illustrative purposes only, as writing is applied by hand and will vary slightly from decoration to decoration. 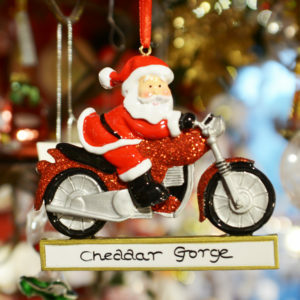 Hand written Cheddar Gorge hanging decoration. Christmas Tree Decoration. Material: Poly resin high quality gloss finish giving the appearance of glazed ceramic. Approximate Dimensions: 8 x 9cm Comes complete with hanging ribbon. Image shown is for illustrative purposes only, as writing is applied by hand and will vary slightly from decoration to decoration. 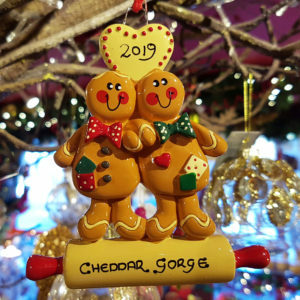 Hand written Cheddar Gorge hanging decoration. Christmas Tree Decoration. Material: Poly resin high quality gloss finish giving the appearance of glazed ceramic. Approximate Dimensions: 9.5 x 10cm. Comes complete with hanging ribbon. Image shown is for illustrative purposes only, as writing is applied by hand and will vary slightly from decoration to decoration. 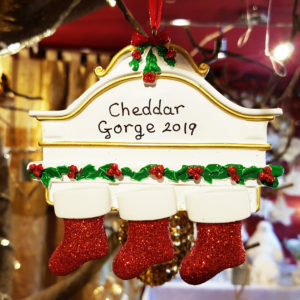 Hand written Cheddar Gorge hanging decoration. Christmas Tree Decoration. 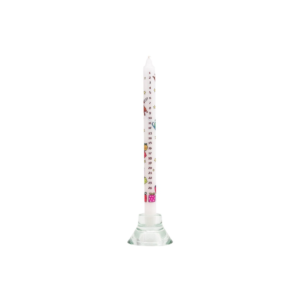 Material: Poly resin high quality gloss finish giving the appearance of glazed ceramic. Approximate Dimensions: 11.5 x 10cm. Comes complete with hanging ribbon. Image shown is for illustrative purposes only, as writing is applied by hand and will vary slightly from decoration to decoration.